A fellow I help proof stories for, DrakeyC, has started the undertaking of re-scripting and re-spriting (if that's not a real word, it should be!) Final Fantasy VI. Now before you ask, yes, there's already been a fan edit in Pony Fantasy VI. This is Drakey's own take on how to incorporate FiM into this game. Whenever I see these art pieces, I've got to post about them. Not enough love for the SNES era of gaming lately. This art post is not something we commissioned, but it's fun to share. Plus, since Ultros didn't make it into our story, this is our chance to give the tentacled one some love. Some fanart I came across that I would like to share because it's pretty awesome. Now to be clear, this is not art that myself or Trevor commissioned or a fan made because of our story. This is someone else's take on the characters. I saw this story and knew I had to post about it. A fellow by the name of Chris Olian created a three canvas painting of the iconic Kefka battle at the end of FFVI. It took over 200 hours to complete. The painting will be donated to the Child's Play Charity Dinner auction. A group called Crystals for Life are raising money for type 1 diabetes research. They are speedrunning a variety of Role-Playing Games, including Final Fantasy VI this Sunday. So check them out and donate for a good cause! 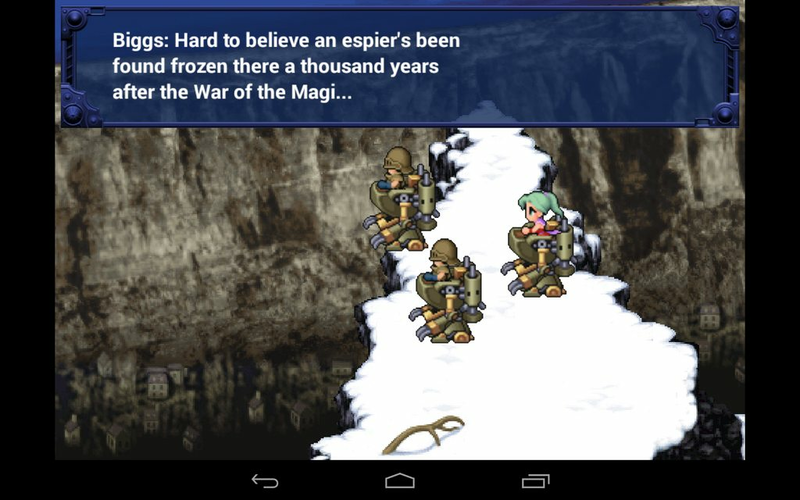 So the mobile version of Final Fantasy VI has been released and it looks like it's a fairly decent port. ... except that typos still manage to get through the play-testing process. Espier indeed. The game's expected to be released to iOS sometime this Winter. Let's hope that the Apple team has better proofreaders. Due to reasons, the upcoming chapter for FFVI will be on the back burner. We'll instead be focusing our attentions on doing some rewrites for the first few chapters. Nothing too major will change so don't fret about needing to reread past parts in order to keep up. Thank you all for your patience! We hope what we have planned will exceed expectations when next we meet! Hello, there! RTStephens here to share with you something I found while poking around fanfiction.net. An author going by the name Celes Chere (best character by the way) posted up a novelization of the entire Final Fantasy VI game. It's not too bad a read and should you need your Squaresoft fix while you wait for us to churn out the next chapter, give this one a chance.